Rep. Peter King (R., N.Y.) continued to take shots at the isolationist wing of the Republican Party on Thursday, claiming many in his party believe the National Security Agency and drone program pose more of a "real threat" than al Qaeda. "You have people on the right sounding like 1960s antiwar Democrats and you have people on the left sounding like Ayn Rand," King told an audience at an American Bar Association event at the University Club in Washington, D.C. "The world’s coming full circle … and if we keep digging circles we’ll open ourselves up to another attack." King said the average member of Congress elected during the 2010 wave does not consider homeland security a top priority. "The intensity of the opposition comes from many of those who were elected in 2010, many people on the right," said King, who is chairman of the House homeland security subcommittee on terrorism. "I would say that the locker-room talk you pick up is they would just as soon have the Department of Homeland Security abolished. They don’t know what purpose it really serves. They would certainly have the [Transportation Security Administration] abolished." 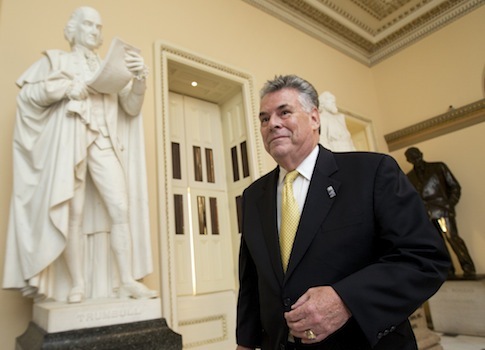 The New York congressman has sparred with fellow Republicans, most notably Sen. Rand Paul (R., Ky.), over the NSA surveillance controversy and other war on terror issues. "People like Rand Paul, that wing of the Republican party, is extremely, almost hostile" to homeland security issues, King said. However, King did praise two GOP congressmen elected in 2010, Reps. Tom Cotton (R., Ark.) and Mike Pompeo (R., Kan.), as "outstanding former military people, very strong on national security." The congressman also defended NSA surveillance, arguing that that there are misconceptions about the breadth of the program. "Right now, there’s a total of 60 Americans around the world whose phone calls are being monitored by the NSA," said King. He also dismissed claims that the NSA could abuse its power for political purposes, saying there was "no comparison" between the counterterrorism agency and last spring’s Internal Revenue Service scandal. "Everything the NSA does is subject to cross scrutiny," King said. "[IRS actions] are not subject to this constant scrutiny of the [Foreign Intelligence Surveillance Court], of the Justice Department, of the intelligence committees in both houses [of congress]. That’s been lost in the debate." He added that he was skeptical of the NSA reforms the Obama administration said it would make after the program was publicized. "Are we making reforms just for the sake of satisfying the editorial page of the New York Times, or satisfying [admitted NSA leaker Edward] Snowden?" King said. "What is the purpose of these reforms?" This entry was posted in National Security and tagged Al Qaeda, Peter King, Tom Cotton. Bookmark the permalink.